Product information "Pancake Load cell V70N"
The V70N is a load cell with a low profile for compressive loading. The electro-polished stainless steel construction in its hygienic design is ideally suited for environments with high standards of cleanliness and hygiene. Due to the central, free-swinging force introduction this pancake load cell is largely insensitive to eccentric or side loading. The load cell is made of stainless steel, hermetically sealed laser-welded and meets the requirements of protection class IP66. Weighing systems for tank and slo systems in the food and in the pharmaceutical industry. Measuring the compressive force and general force measurement. 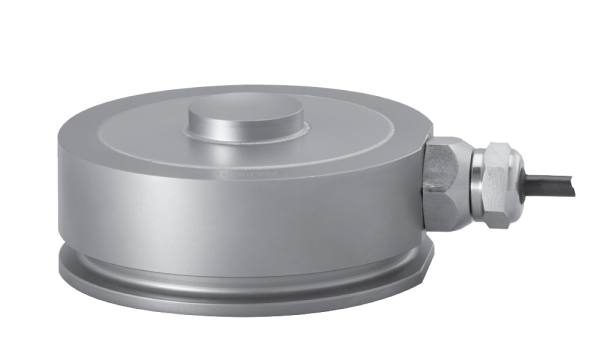 For accurate weighing the disc-shaped compression load cell made of stainless steel with bottom abd cover plate, lift-off and lateral force and moment-free force application makes. The low height and the lift-off with central, free-swinging force application makes this pancake load cell largely insensitive to eccentric or side loading. A significant advantage of the compact load cell is the high side and lift-off high security. The pancake load cells are fixed at the ends by bolts on a stable base plate. Related links to "Pancake Load cell V70N"
Our comment on "Pancake Load cell V70N"